OMG! I have a chance of being first in the Fabulous Farley's Currently so I am going to link up and then come back and write more. BRB! OK, so I wasn't first but I am second!!!! That's a new record! WOOHOO (It's the little things in life, folks). The terrific Miss T from Journey of a Substitute Teacher beat me to it and is first....she's a sweety so I guess I can live without being first. Listening: I am listening to the Apprentice but I wish I was listening to the rain. We need rain here in San Antonio! I could also go for some cooler weather but it hasn't been too bad. Loving: All staff members at my school can wear jeans the whole week because we have STAAR testing on Tuesday and Wednesday! That is the absolute ONLY thing I like about state testing. Thinking: Report cards are due tomorrow and I still need to finish up a few more comments.... why am I blogging instead of doing what I should....story of my life peeps! Wanting: My students are taking the writing STAAR tests on Tuesday and Wednesday. I want them all to pass. Not necessarily for me but for their own self-esteem and to show them that hard work pays off. Needing: I said coffee but I am really needing to get back to report cards!!!!!!!! Advice: Society as a whole is getting so serious! I think we all should stop being so serious and take the time to smell the roses (or the chocolate, it smells better) and laugh your boo-tay off! I love to laugh! I love to make others laugh! And I especially love to see others laugh! Aww don't be mad that I beat you on linking up. I'm shocked I'm first...not 150 hahaha. Mmm what kind of cake? I've got some German chocolate we could swap! Ha Miss T! You are fast girly! I wonder how many of us teacher bloggers try to be in the top 10 of Farley's linky? HAHAHAHAHAHA I am eating red velvet cake....YUM! Way to go on top 10 Jivey! Hahaha glad you forgive me! Thanks Caitlin! Normally we can't wear jeans but 4th and 5th graders are taking the firsts of their state tests this week and as a treat our principal lets us wear jeans. YOU WERE NUMBER TWO!!!! YAY!!! and good luck on the STAAR!!! Number two is awesome but its still not number one! Did you ever think that you would have bloggers stopping everything to be number one on your Currently linky? Good luck to your kiddos too! You were faster than me!!!! I made it to number three! Jealous on the jeans- we only get to every other Friday! Usually I am number 78,234 on the Currently linky so #2 is awesome! We only get to wear jeans because our 4th and 5th graders are taking their state tests.....the only good thing about testing! I get jeans 4 days this week! Woot! Good luck on the STAAR! Good luck to you and your kiddos on the STAAR too Suzanne! Ha! I love that you came back to add more after you linked up! I have a love hate with Apprentice, but only because of Omarosa. She's a bit calculated! After you finish report cards, it should be a great week! Jeans will be wonderful. Wow! Second seems pretty good to me! I definitely agree with you about not taking things too seriously. I love your sense of humor! 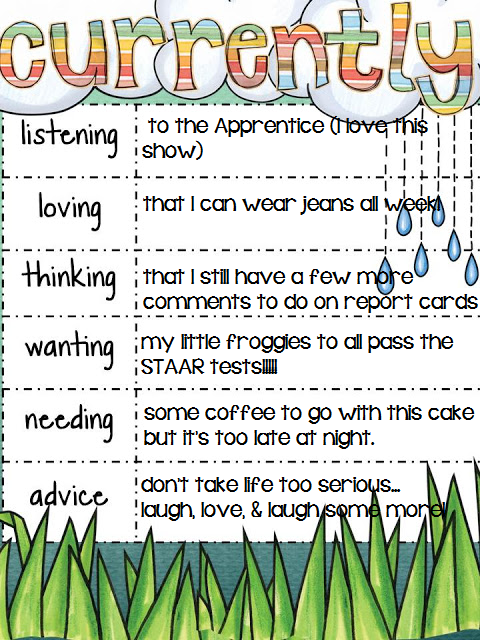 1) Jealous about your jeans week, but STAAR is awful so you deserve it! 2) GOOD LUCK tomorrow! At least then the writing portion of STAAR will be over! Sending GIANT good luck wishes from California for your STAAR test. Number 2 on Currently? I was excited to be in the Top 100! hehehehe... I always end up being in the 300ish range! Congrats on being 2nd!